Great location, friendly staff and very relaxing. Dishwasher and kettle didn't work properly, but we didn't mind given how close the apartment was to the beach. Love the accomodation and helpfulness of staff. Very family friendly. Great sized room, good location just up the hill out of the hustle and bustle of Noosa shops, will be back! Fabulous Bech front position. Great check in girl. Situated on the boardwalk, this apartment building is within 1 mi (2 km) of Noosa Beach and Noosa National Park. I Liked the location, it close to the shops and to Hastings street and the main beach. Nestled on the beach, this Noosa Heads apartment building is just steps from Hastings Street and Noosa Beach. Noosa National Park is 1.2 mi (1.9 km) away. You always said you would go on a dream holiday someday. Now, someday is here. But you don’t just want to dip your toe into the trip of a lifetime, you want to cannonball into the deep end. Go ahead, unplug and unwind in style. When you book one of our Noosa Heads holiday rentals, the ordinary is in the rearview. Instead of sharing your vacation with hundreds of hotel guests, you get to take advantage of all the space at your private apartment. You also get to enjoy all the amenities of a private residence for a truly unique and memorable stay. Why don’t you take off your shoes and settle in for a while? Your holiday just got upgraded. As much as you love your vacation rental, it’s always good to get out and explore to soak up Noosa Heads. Live like a local: Eat regional food, cheer on the home team, and visit the best cultural attractions in town. No matter the season, there is always something going on in Noosa Heads. 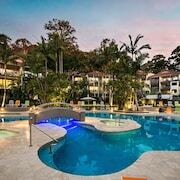 Seeing all the best attractions is bound to make you fall in love with Noosa Heads. Who knows, you may even be tempted to extend your stay. There’s a reason home rentals are so popular here—after a long day of exploration, going back to your very own living room to stretch out is a dream come true. It’s your escape so why share it? You deserve your own slice of paradise. Booking your holiday rental on Expedia is simple and safe. Just pick your dates to search for the perfect property and book securely. We let you contact the property owner directly to make any special arrangements. All that’s left to do is show up with bells on and have a memorable vacation. With all the amenities available in Noosa Heads short-term rentals, that won’t be hard to do.